Baby Menace (Miss Astræa) is home at last! Hermione & Lysander’s youngest sibling arrived at the Blastmilk Orphanage on August 6th. We’ve been so busy with moving preparations and surprise visits from abroad (Micha from New Orleans! Liz in SF who I still don’t manage to see enough!) that I barely had time to marvel. She’s amazing. I really love her default face-up. It is very evocative of Sasha, without being a clone. My only kvetch is that the beautiful strawberry blonde eyebrows are too high. But they’re so lovely! So I’ll keep them for a bit… at some angles she’s very, very sasha-like, though she is a bit different. I’m waiting for the detailed comparison photos from those who can compare them. Her head is tiny, regular SD (9-10) size wigs swallow her head, so definately a DD (8-9) wig girl. “Sasya” is scratched on the inside of the headcap. Which makes me think (duh) that they resculpted right off of a Sasya head. Awesome. The 18mm melon eyes I got from Gina are gorgeous but too large I think. Time to order 16mm! I know ya’ll know what this girl means to me. The fact that she was made at all is such a stunner that I’m completely gobsmacked and have been since I found out about the release. Oops, looks like I ran out of time to thank Mr. Kallisti… bah! I love him so much, and he lets me. That is all. Fifi Mahony, returns from rehab! 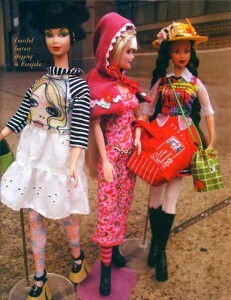 It is like getting a whole new doll! Who knew she’d clean up so nice. She may be tamer, but I’ve warned Mr. Kallisti that she still might get him in the middle of the night if he’s not nice to her. Rawr. Fifi Mahony turned three on January 20th, ‘magine that! Continue reading Fifi Mahony, returns from rehab! 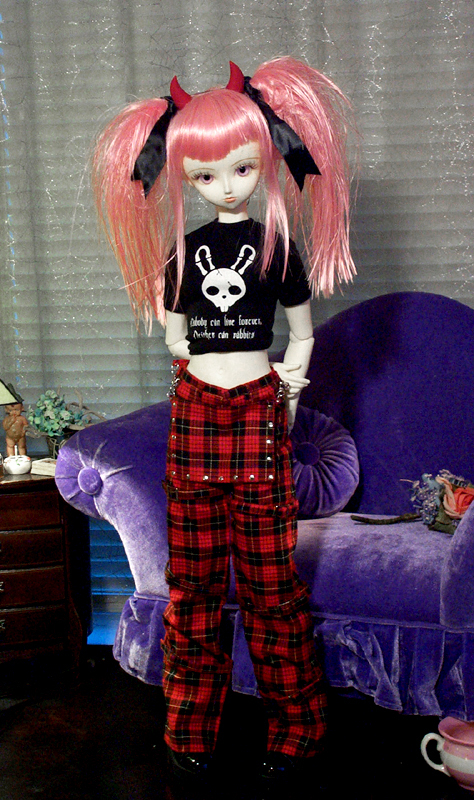 Posted on March 7, 2007 January 30, 2011 Categories Asian Ball-joint Dolls, DollhouseTags fcs, fifi mahony, super dollfie, volks16 Comments on Fifi Mahony, returns from rehab! Hermione & Miette won 2nd Place and a big granite trophy in the dolly costume contest for “Bo Peep and Her Sheep.” I didn’t get very good pictures as it was really crowded! So official photoshoot for the archives SOOOOON. Also got interviewed by Mikey for the Japanese Television. That was nerve wracking. I look real purdy in my Laughing Sal outfit with my toof all blacked out. Pretty girl! It was a barrel of excitement, everything happens so quickly it is hard to keep up. Such a whirl! 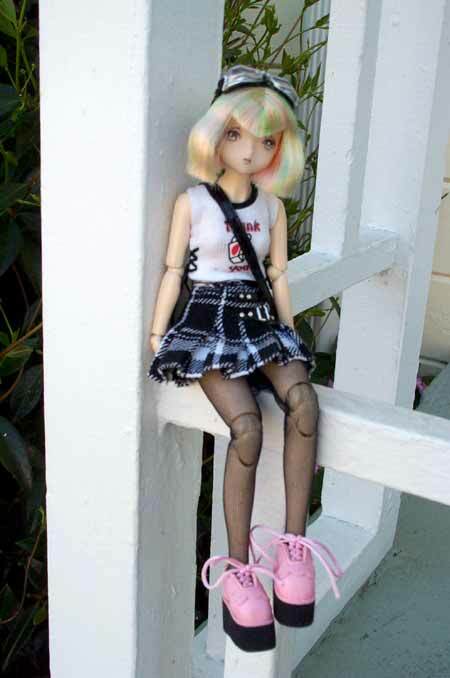 3) October 2007: Japanese Style Dolpa in Los Angeles. They will be hiring a 747 to fly out 500 Dealers & Fans from Japan, and encourage U.S. people to get sewing so they can be dealers too! Location at Hotel and reservations to be announced. Also an LE doll for this event. And a couple more choice selects from Melissa (swak! ): Paul & Heads, and me in really fancy company w/ trophy. P.S. Special congrats to Aimee for finally winning the baby angel of her heart. And A.J. too! Wow! No postcards! 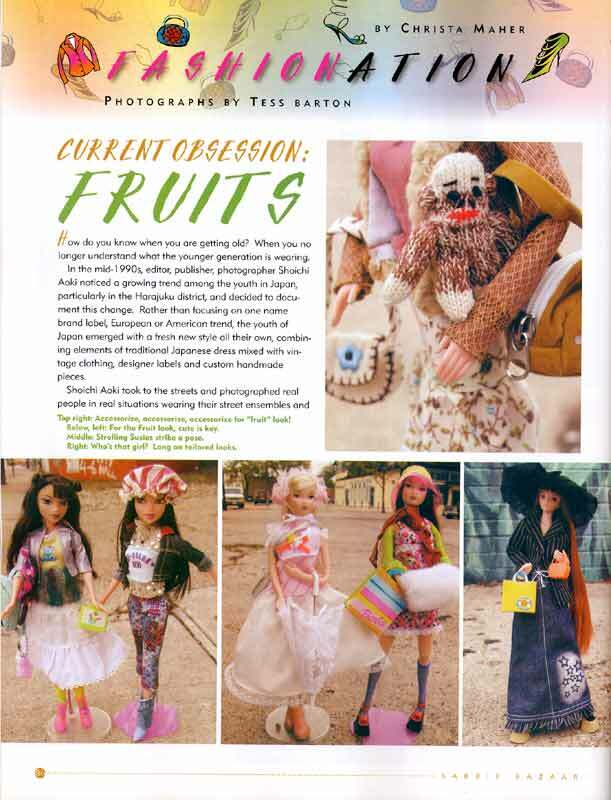 Posted on October 31, 2006 September 5, 2011 Categories Asian Ball-joint Dolls, Dollhouse, Travel & AdventureTags blobpus, Dolly Couture, kaiju, volks2 Comments on Volks Halloween Party! 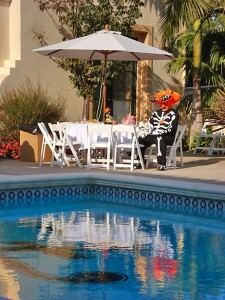 Getting ready for the Halloween Fete this weekend. Phew! I hate it when you get to the end, or nearly so, and you just don’t want to work any more. Sigh… so much fun though. I wish I could quit my day job. Heh! Holy moly! Wowie. Tinatsu the pusher is at it again! Clicky for VolksUsa blog post. More info available soon I hope! October 29th . Woo. Volks is slowly posting all the goodies from the August twin dolpas. 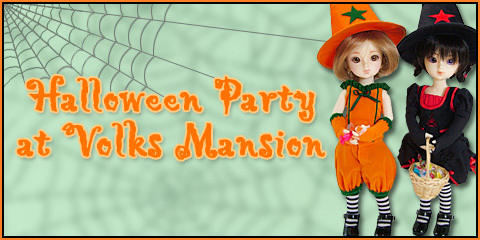 They’re re-releasing the early White Rose favorites pumpkin pants for msd & the SD13 lingerie but NEW! with ribbons in pink and blue. I stalked YJP like a crazy stalking stalker trying to get those sets! So, have at them, kiddies! Like the LA Tea one-offs, I already have my favorites… but what I really want is that blue swimset (?) that Nono is wearing. You know, I secretly pine for a Nono. FCS Nono in white please, thanks! Goody box from Volks arrived Wednesday. The glasses are awesome. They’re all perfect and everything. I also really like the dress. S’cute! Gosh, if they could do cute stuff like the wtg line 60cm style, what a killing they’d make! But I guess the size and the price point probably make that prohibitive. Meh. Posted on June 30, 2006 September 5, 2011 Categories Asian Ball-joint Dolls, DollhouseTags Dolly Couture, super dollfie, volks1 Comment on Help! Ahoy! Calliope grabs a stiff one! also… she’s still one of my favorites. eeeeeee! Posted on March 22, 2004 April 3, 2015 Categories DollhouseTags Blythe, Calliope, dollfie, volks4 Comments on Ahoy! Calliope grabs a stiff one! 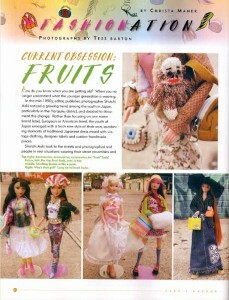 Yes indeedy, the April 2004 edition of Barbie Bazaar did a photo essay on Fruits, not only featuring Barbie but a couple of Rudi’s Suzie & Volks’ Who’s That Girl! Woo! She’s been here all afternoon, and after running some errands we were finally able to sit down and open her! And then I’ve been taking pictures all evening. But you know what? That is ok. Cuz she’s gorgeous, even with the default natural make-up. Besides, I want to redo it myself anyways, and this will give me more of an excuse now that I don’t have to worry about messing up a custom volks gothy smokey make-up job. So, I’ve been playing with wigs and outfits all afternoon. The pink one is a re-styled poshdolls wig, the other ones are obviously Volks. The wig she came with is unbelievably gorgeous. An inky midnight blue. I might, after a bit, iron it straight after all. Haven’t decided yet! 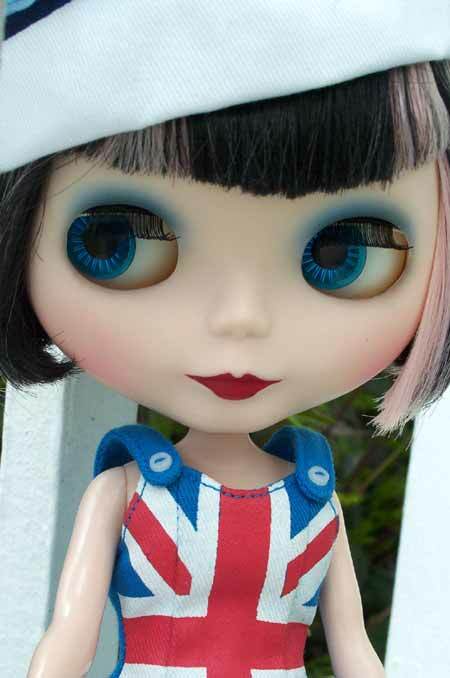 And her eyes, volks glass neosium, are stunning! Sometimes they’re rosey lavendar, sometimes they’re purple, and sometimes even pink! Aaaaaaaaaaaaah! I die! 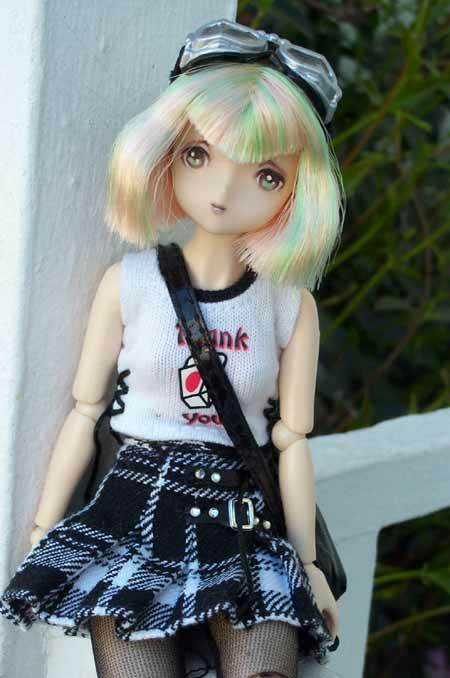 Posted on January 20, 2004 April 3, 2015 Categories Asian Ball-joint Dolls, DollhouseTags fcs, fifi mahony, super dollfie, volks5 Comments on Introducing Miss Fifi Mahony!